In 1919, Covington & Burling represented Norway in the Norwegian Shipowners arbitration with the USA in The Hague, winning the then enormous payout of US$12 million – a case that helped establish the early principles of expropriation and is still taught in law schools today. The firm has kept up its work in the area into modern times. Indeed, when GAR launched in 2005, Covington was among the few Washington, DC players with a strong reputation in commercial and investment arbitration – particularly cases with a Latin American dimension. The European practice began to take off in 2009 with a pair of significant lateral hires in London: Stephen Bond, former head of White & Case’s arbitration team in Paris, and Gaëtan Verhoosel, a rising star who joined from Debevoise & Plimpton and became practice co-chair in 2011. However, the past few years have seen the departure of Verhoosel to Three Crowns and the loss of other senior figures, including well-known arbitrators Oscar Garibaldi and Thomas Johnson, who left for independent practice and the Iran-US Claims Tribunal, respectively. The practice is now co-chaired by London-based Jeremy Wilson and Marney Cheek, an investment and trade law specialist in Washington, DC. Partners Jonathan Gimblett in DC and David Pinsky in New York are also names to know. The most important offices for arbitration are London and Washington, DC, with others stationed in New York and Dubai. The wider firm has offices in the US as well as Brussels, Frankfurt, Johannesburg, Beijing, Seoul and Shanghai. Its Asian presence and experience in India and Latin America put Covington in a good position to work on “South-to-South” disputes. Covington has counselled ExxonMobil, Occidental Petroleum, Murphy Petroleum, Swedish shipbuilder Kockums, Newmont Mining, Merck, Sumitomo and a group of Spanish investment funds that lost money when the Yukos Oil Company collapsed. It has acted for US pharmaceuticals group Eli Lilly in a NAFTA claim against Canada, and Mexican food conglomerate Gruma in a US$500 million claim against Venezuela. A rare state client is Ukraine (and its national gas company Naftogaz) in various investor-state and state-to-state matters arising from Russia’s 2014 annexation of Crimea. In 2017, Covington secured an ICSID award worth nearly US$500 million for Spanish subsidiaries of Mexican food group Gruma in a claim against Venezuela over the expropriation of their tortilla and corn flour businesses. The firm’s work for ExxonMobil against Venezuela produced some substantial awards. A US$7 billion ICC claim against state oil company PDVSA ended in 2011 with a US$908 million award in Exxon’s favour, which the state satisfied in the following year. A parallel ICSID claim ended in 2014 with an award for Exxon worth US$1.6 billion, though that figure was slashed to US$188 million by an annulment committee three years later. Another ICSID case against Venezuela saw Covington help US-based oil services company Tidewater win US$46 million plus interest in 2015, although an annulment committee later reduced the award by around US$10 million. A US court enforced the award in early 2019. As co-counsel with Sidley Austin, Covington managed to get a US$200 million LCIA claim against the Trinidadian state oil company, Petrotrin, dismissed in its entirety in 2014. The counsel team received praise from the Caribbean state’s attorney general, who said that a loss would have bankrupted the company. In 2012, a Covington team persuaded a panel in Stockholm to award damages to a group of Spanish minority shareholders in Yukos. However, the award was later set aside in the Swedish courts. Looking back to the 1990s, the firm represented oil company Amoco in a major matter at the Iran-US Claims Tribunal, winning US$850 million. In a pair of unusual cases, which have both now settled, Covington acted for Swiss labour unions in disputes with global fashion brands over their adherence to the Bangladesh Accord, drawn up in the wake of a garment factory collapse in Dhaka to raise standards of safety. The cases in The Hague have been used as an example of how arbitration can be used to enforce human rights in a business context. The firm had success for Naftogaz in early 2019 with an award holding Russia liable under an investment treaty for the expropriation of its assets in Crimea. The tribunal has still to rule on a US$5 billion damages claim. Covington has also been assisting Naftogaz with US discovery applications as the company tries to locate assets of Russia’s Gazprom that can be used to satisfy a US$2.56 billion SCC award. It is also acting for Ukraine in a politically sensitive state-to-state arbitration with Russia over the alleged usurpation of its rights in oil-rich waters adjacent to Crimea, including in the Black Sea. The firm told a five-member tribunal in November 2018 that the dispute had been "significantly aggravated" as a result of Russia firing at and seizing Ukrainian vessels. Covington (together with Baker Botts) helped US company Cobalt International Energy to settle a dispute with Angola’s national oil and gas company Sonangol over two offshore oil blocks that gave rise to a pair of ICC arbitrations worth more than US$2 billion. It secured a new instruction from the US’s Vulcan Materials in a NAFTA claim against Mexico over alleged discriminatory measures that harmed its investment in a limestone quarry. Former Covington lawyer Monique O’Donoghue returned to the firm from K&L Gates in September 2018, joining as of counsel in London and Dubai. José Arvelo in Washington, DC and Ian Redfearn in London were promoted to special counsel. Jose Rojas from Spanish renewables group EDPR says that Covington has a “highly trained team with a high degree of attention to detail”, singling out Nicole Duclos for praise for the way she managed a multidisciplinary team. Covington is widely recognized as one of the world’s preeminent international arbitration practices. Building on a tradition of excellence in this field since 1919, our practice today comprises over 50 lawyers handling commercial and investment disputes under the rules of every major arbitration system in the world, based in Europe, the United States, and the Middle East. Our lawyers are also regularly selected as chairs and party-appointed arbitrators in both commercial and investor-state arbitrations. Our experience, combined with Covington’s renowned industry expertise in energy, construction and infrastructure, mining, life sciences, defense, insurance, telecommunications, finance, and other sectors, provides clients with an extraordinary advantage. “Very impressive team whose high credentials are matched by their abilities." Depth and Quality. 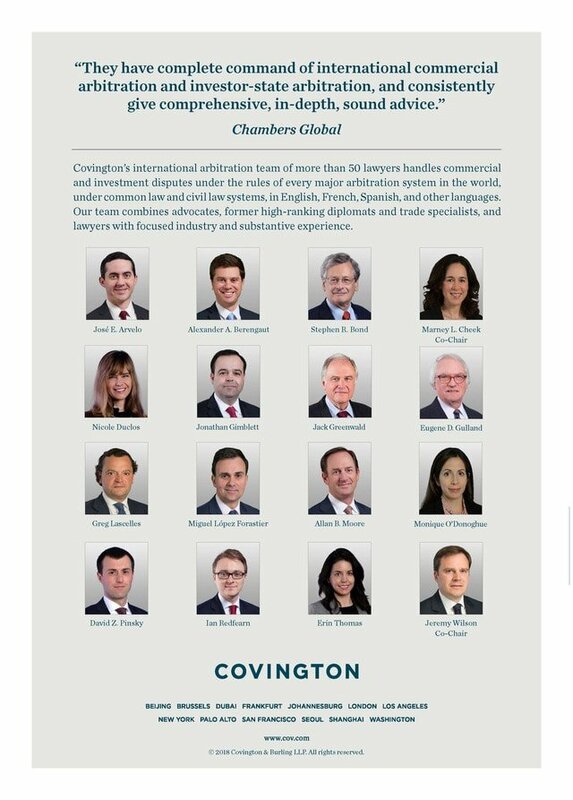 Covington is known for its deep, highly skilled, and unusually experienced bench of multilingual, multi-qualified lawyers. From top to bottom, we offer uniformly high quality. Strategy With Results. We are regularly called upon to serve as lead counsel in some of the world’s most complex and high-profile arbitration matters. We have obtained awards valued at over $5 billion and defeated claims worth hundreds of millions of dollars. We excel in the application of thorough analysis and creative strategic thinking to difficult cases, attention to detail, and a commitment to practical, business-minded lawyering. Inter-Disciplinary Expertise. Our case teams combine first-rate advocates, who are known for their “stand up” skills and credibility before tribunals, with leading lawyers in the substantive fields at issue and former high-ranking diplomats and trade specialists — a reflection of our firm’s breadth of expertise and our team-oriented culture.